This day started out like all the others, in addition, there was unexpected excitement in the air. Captain Flemming came on the intercom to announce that there had been a chemical spill in the laundry area of the ship. He said he would keep everyone informed and that the crew was handling it. I was thinking it could be serious, but chances were, it was not. So we didn’t know for a time just how bad it was; was anyone injured; could it be contained? A while later the captain announced that it was a minor spill, and that the spill was cleaned up and the crew was healthy. Disaster averted! This afternoon we heard another intriguing announcement from the captain. 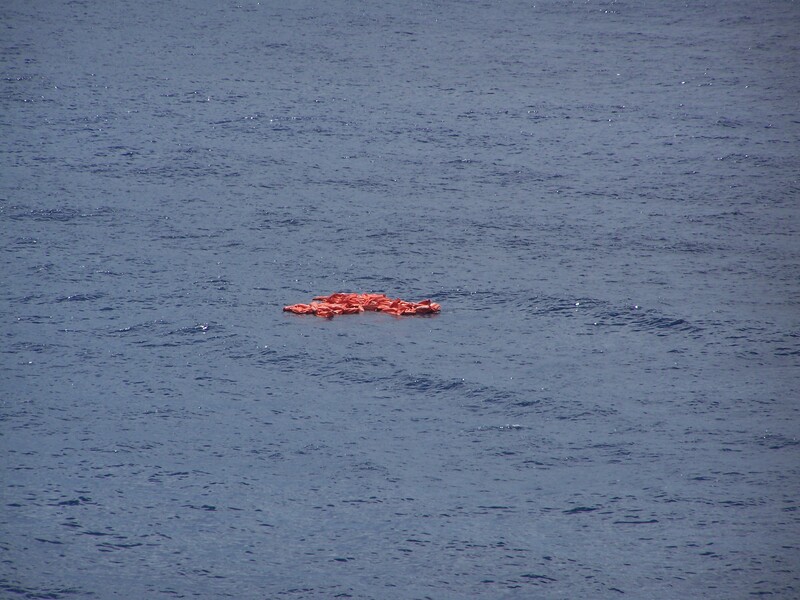 This time he said what looked like an orange life raft had been spotted floating nearby on the port side of the ship. He said the ship was slowing down to investigate. Sure enough we slowed down to seven knots, give or take, and made a wide swing in the direction of the orange object. Soon we saw a small boat with the rescue team onboard speeding toward the floating orange object. We watched as the small boat approached, then circled, the orange object. We were anticipating a rescue about to happen. The small boat then immediately headed back toward the ship…no one needed rescued this day! Thankfully! Very quickly, the captain reported that the object was not a life raft, but a containment buoy like those used to contain oil spills. Excitement over! I’m posting this on the 11th because we didn’t have Wi-Fi last night! Rescue excitement! Not a life raft — just a floating containment buoy!